Since the recent launch of Nokia N95 GPS phone, there has been many cloning or imitate models being released in the market, especially in China. The cloned phone’s pricing is much cheaper with only one forth of the original Nokia retail price. Here is another one that looks exactly the same to original Nokia N95 except many key features such as GPS, Wi-Fi, innovative two-way sliding mechanism and etc were eliminated. You may not able to differentiate it from original set unless comparing side by side or playing with its functionality. 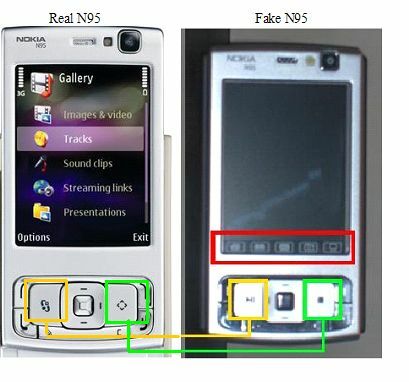 This is not the first time that Nokia N95 has been cloned. There was another model, known as E-PDA V16 that was manufactured based on this famous gadget previously. The E-PDA V16 has slightly bigger size as compared to real unit. And this ‘improved’ version, manufactured by another Chinese maker has made significant improvement based on the original phone’s dimension. Nevertheless, they do have some similarities- those high end features were taken away before coming out with the low end version. Although the 3” 260k color QVGA resolution display is still there, but the 5 mega-pixels camera, GPS, Wi-Fi functions, two-way sliding mechanism and some other advanced multimedia features were removed. These high end features were compensated with normal 2 mega-pixels camera. Of course without Carl Zeiss lens! Another interesting part is laser pointer functionality has been added in the design. Probably these Chinese manufacturers have done some market survey and figured out that laser pointer function is in popular demand especially for these models that were targeted for business executives. It is truly amazing that these Chinese manufacturers can imitate the real unit and some can even release them earlier than the original models. It won’t be surprise that one day these highly talented ‘designers’ may able to comply or even exceed the original models’ technical specifications with shorten TTM (Time-To-Market) and lower cost.